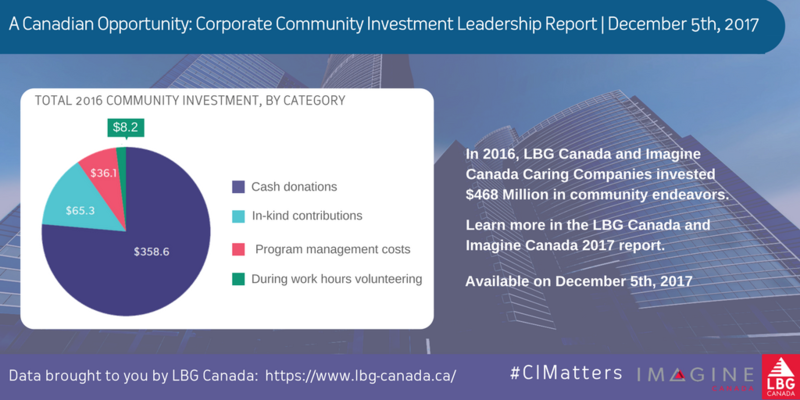 TORONTO, December 5, 2017 /3BL Media/ - Canada's leading corporations widely recognize the business opportunity in putting their brands and resources behind worthy causes, and many plan to increase their community investments, according to a new study issued by Imagine Canada and LBG (London Benchmarking Group) Canada. The 2017 Corporate Community Investment Leadership study expects corporate giving will advance in 2018, driven by economic growth, heightened appreciation of community investment, customer expectations and high rates of employee interest. The 56 companies in the study invested $468 million in communities in 2016. Forty-four per cent indicated their community investments would increase in the coming year with only 26 per cent predicting a decrease. Many corporations linked to community investment with innovation. Almost six-in-ten participating companies (59 per cent) reported community investment activities in at least one key area of the Federal Government Innovation Plan. Education-related community projects were the most common innovation focus. In 2016, companies in the study reported 1.8 million hours of employee time volunteered with an average of 31 hours per employee. Of reported hours, 13 per cent occured during working hours at an estimated value of $8.24 million. Long-term partnerships with charities and community organizations are being leveraged, with 87 per cent of companies in the study reporting multi-year projects within their giving strategy. Community footprints are being deepened by regularly engaging stakeholders (employees, customers, suppliers and government partners) in community investment activities. Most companies (86 per cent) reported leveraging employee contributions as part of their strategy. "This report profiles Canada's leaders in corporate community investment," says Bruce MacDonald, President and CEO of Imagine Canada. "It's a snapshot of approaches businesses of all sizes and levels of charitable giving can leverage for their community investment. Our hope is that the study is widely used by companies as they pursue their community aspirations." Companies participating in the study are Imagine Canada Caring Companies and the LBG Canada network of companies. "Companies within the LBG Canada network have invested more than $3 billion in community since 2007, more than $4 billion if employee and other stakeholder contributions are considered," says Stephanie Robertson, President and CEO of SiMPACT Strategy Group and Facilitator of LBG Canada. "The purpose of the LBG Canada program is to support community investment professionals in demonstrating the value of their work - for the community and for the business. We offer a snapshot of information readily available to corporate Canada, in support of the goal of creating value through community investment." Imagine Canada is a national charitable organization whose causes is Canada's charities. Our three broad goals are to amplify the sector's collective voice, create opportunities to connect and learn from eachother, and build the sector's capacity to succeed. Corporate community investments are an integral part of Imagine Canada's vision for a vibrant and strong charitable sector. Imagine Canada's Caring Company designation encourages companies to adopt a leadership role as investors of 1% of pre-tax profit into stronger communities. For more information, visit: www.imaginecanada.ca.